AUSTRALIA is about to get its first commercial space station which will be launching rockets within a year, the firm behind the project said. AUSTRALIA’S first commercial space station is expected to be established and launching rockets within a year. Commercial rocket launching company Equatorial Launch Australia, has secured a lease with traditional owners for about 60 hectares of land, to build a rocket base in the Northern Territory. The site is about 30km south of Nhulunbuy, in North East Arnhem Land. ELA expects to start construction of the Arnhem Space Centre early next year, with the first launch at the end of 2018, once regulatory processes and environmental assessments to “get a space license” are complete. 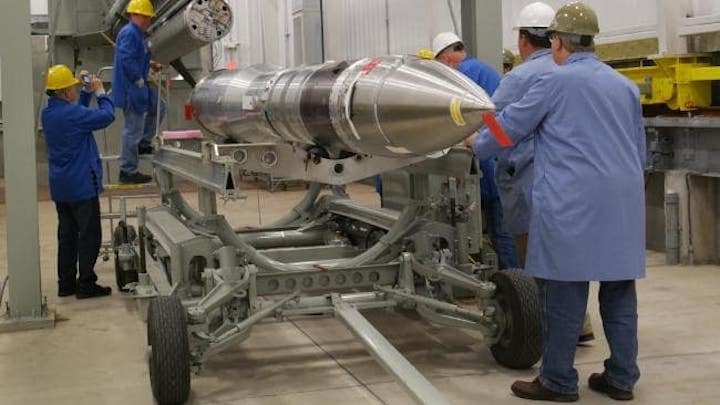 Sounding rockets up to 15m long — which are used by pharmaceutical and research companies, universities, space agencies and many other organisations to collect data and conduct experiments — will be launched from the site. ELA spokesman Shannon Brown said sounding rockets “go up into the edge of space and have a hang time of 15mins in zero gravity” before they return via parachute to a designated area on earth. “They take scientific instrumentation and payloads to conduct experiments in a zero gravity environment,” Mr Brown told news.com.au. 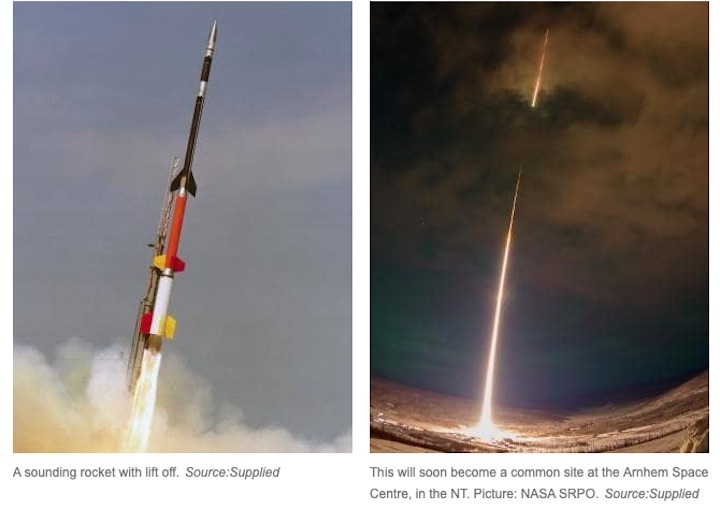 The sounding rockets are also used for monitoring and observational purposes. “The initial observations of the green house effect and the destruction of the ozone layer were made using sounding rockets,” Mr Brown said. WHY IS IT BEING BUILT IN THE NT? The land — which belongs to Galarrwuy Yunupingu’s Gumatj clan on the Gove Penninsula — was previously used by the European Space Agency in the 1970s as a tracking station. At just 12 degrees south of the equator, the location provides a more cost effective way to reach Earth’s orbit. According to ELA, its customers will include private companies; weather monitoring organisations; research laboratories; universities; and international space agencies such as NASA. Mr Brown said NASA has visited the site and expressed interest in using it for a potential launch in 2019. But the base won’t resemble Cape Canaveral, home to the Kennedy Space Centre in the US, according to Mr Brown. In fact, it won’t appear to be anything special at all. “The pads for that these rockets launch from are quite small, the size of swimming pool,” Mr Brown said. The Arnhem Space Centre will cost a total of about $5 million, according to the ELA. “It’s a mostly private investment, but we’ve had some assistance from the NT government, the total cost of construction by competition will total about $5 million,” Mr Brown said. The NT government has signed a Project Facilitation Agreement with ELA, Gumatj Corporation and Developing East Arnhem Limited to support collaboration over the first phase of the project. The centre is expected to unlock more than $100 million in economic benefits for the NT. The space industry is worth about $300 billion globally. NT Chief Minister Michael Gunner said the centre will have the potential to create approximately 35 jobs during construction period and 32 full-time equivalent jobs once operational. “The Arnhem Space Centre will be a significant site in the Asia Pacific region and will attract new business to the region. In addition to launching satellites there will be opportunities with a focus on science, technology, engineering and maths,” Mr Gunner said. “The project will support job creation, drive innovation and development of new technologies, boost tourism and attract new investment. Mr Gunner said the Gumatj clan’s sublease to ELA demonstrated incredible potential of Aboriginal lands and the desire for indigenous businesses to innovate for the future of their people. The confirmation of a lease agreement comes after the NT Government signed a Memorandum of Understanding (MoU) between the governments of South Australia and the Australian Capital Territory to support the growth of the Australian Space Industry, at the 68th International Austronautical Congress (IAC) in Adelaide earlier this year.